In celebration of 40 years making some of the best cigars on the market, Macanudo released its 1968 line. These hand-rolled premium cigars were a classic hit. Combined with a premium blend of Dominican, Nicaraguan, Ometepe tobaccos that make up the fillers, binders made of perfect Habano Connecticut Broadleaf and bound together with an enriched Honduran San Agustin Havana wrapper. With each draw, Macanuco 1968 handmade cigar gives its user a very bold and decadent flavor of triple espresso and strong coffee bean taste and aroma. An old world construction with a perfect burn is what makes the Macanuco 1968 premium cigars one of the best on the market. 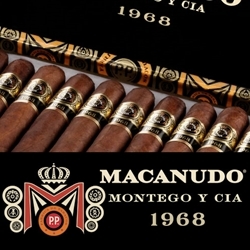 Macanudo 1968 won critical acclaim, scoring a rating of 90 in Cigar Aficionado and Cigar Insider. Try one of the varieties of sizes and flavors listed below. Each of these styles are available today for a discount price! Call us for more details!